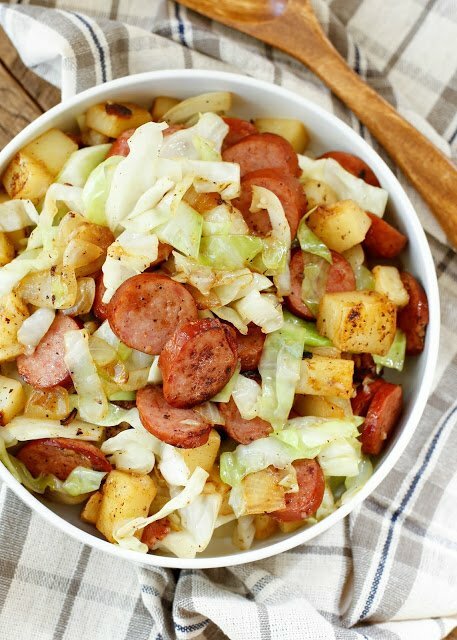 Tender potatoes, fresh cabbage, and salty kielbasa are about all you need to make this quick and easy flavor-filled Kielbasa Cabbage Potato Skillet. There is never a bite leftover when I make this and my kids ask for it often. I never have a problem fulfilling their request for this tasty skillet dinner because it takes just 20 minutes from start to finish. This is one of those recipes to keep in your arsenal for the nights when you need a fast meal that will please everyone at the table. As I was making this dinner for about the tenth time this year, it occurred to me that I’ve never actually posted it. It’s a super quick adaptation of this hash recipe and my boys love it. Best of all, my family loves kielbasa, so I know I’ll never hear any complaints when this dish hits the dinner table. My kids love Kielbasa and it’s featured in one of our dinners at least a couple times a month. 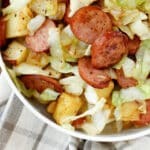 Kielbasa is something that you will almost always find in my refrigerator and we enjoy it in everything from Kielbasa and Shrimp Fried Rice to Cabbage and Sausage Skillet. The combination of Kielbasa sausage and cabbage is always a hit. These two inexpensive staples become an incredible and satisfying meal when cooked together. Cabbage doesn’t always have the best reputation. It can be bitter and tough when eaten raw and get unappealing if overcooked. When cooked right though it’s one of my favorite veggies. This cabbage is pan fried in the skillet along with the spicy flavorful kielbasa, olive oil (or coconut oil) and garlic. The result is a lightly sweet and aromatic cabbage that’s tender but not mushy. This is one of the best ways to prepare cabbage in my opinion and my family agrees. As I mentioned before, kielbasa is a staple meat in our house. Over the years, I’ve come up with dozens of ways to serve this favorite variety of sausage. If you haven’t gathered by now, I love an easy skillet dinner. This Skillet Mexican Street Corn with Squash and Kielbasa combines the ultimate sweet and spicy corn dish with sausage in a way that blows my socks off every time I make it. If you like garlic and potatoes as much as my family does, you should also give this Garlicky Potato Kielbasa and Green Chile Skillet meal a try. The addition of green chiles to the sausage and potatoes makes this easy dinner something special. Along with skillet dinners, one pan sheet meals are high on my list for quick no-fuss meals. Rebecca hit it out of the ball park with this Kielbasa and Pierogies Sheet Pan Meal! I enjoy kielbasa and cabbage on their own but this dish also includes potatoes to bring the whole thing to a different plane. Pre-cooking the potatoes in the microwave is a great way to get this meal on the table fast. If you prefer not to use a microwave, you can boil the potatoes until they are fork-tender, about 8-10 minutes, drain, and then add to the skillet. I’ve made this recipe both ways and never noticed a difference in taste between microwaving and boiling. Peel and chop the potatoes, rinse the potatoes and place them in a medium-size glass bowl. Sprinkle the potatoes with ½ teaspoon salt and ¼ teaspoon black pepper, stir or toss with your hands. Microwave the potatoes for 4 minutes, stir and microwave an additional 2-4 minutes until fork tender. While the potatoes are cooking, warm a large skillet over medium-high heat. Add the oil and as soon as it’s shimmering, add the onions. Saute for a few minutes, until the onion is barely tender and lightly browned. Add the garlic and the kielbasa. Cook while stirring frequently, for about 3 minutes. When the potatoes are tender, add them to the skillet. Toss to coat, adding a small additional drizzle of oil only if needed. Spread the potatoes across the pan and allow them to cook for 2-3 minutes, stir and continue cooking until lightly browned. Add the cabbage and sprinkle with 1/4 teaspoon salt and the remaining 1/4 teaspoon pepper. Toss to combine, add 2 tablespoons water to the skillet and reduce heat to medium-low. Cover with lid. Cook for about 2 minutes, until the cabbage is bright green and barely wilted. Taste and add additional salt, only if needed. Enjoy! 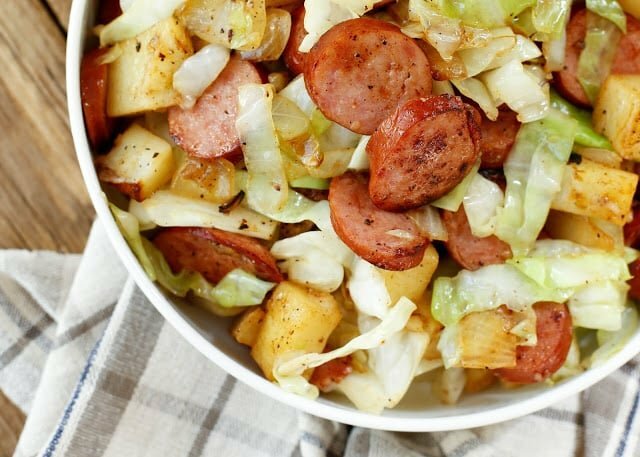 Tender potatoes, fresh cabbage, and salty kielbasa are about all you need to make this quick and easy flavor-filled dinner. While the potatoes are cooking, warm a large skillet over medium-high heat. Add the oil and as soon as it's shimmering, add the onions. Saute for a few minutes, until the onion is barely tender and lightly browned. Add the garlic and the kielbasa. Cook while stirring frequently, for about 3 minutes. When the potatoes are tender, add them to the skillet. Toss to coat, adding a small additional drizzle of oil only if needed. Spread the potatoes across the pan and allow them to cook for 2-3 minutes, stir and continue cooking until lightly browned. COOK'S NOTE: For this recipe, I prefer the cabbage barely wilted, with a slight crunch. If you like yours a bit more tender, simply add a few minutes to the final cooking time and remove from the heat when it is cooked to your liking. Looking for even more Skillet Dinners? Check out this Spicy Italian Bell Pepper Skillet and Spicy Chicken and Bacon Stir-Fry on my site. Sausage and Egg Skillet with Thanksgiving Leftovers by Dessert Then Dinner and this Skillet Pasta Primavera by Flavor the Moment are more skillet recipes you might enjoy!